The Senate met today and approved four pieces of legislation passed up to them following last Thursday’s special sitting of the House of Representatives. As was the case at last week’s session of Parliament, the bill to attract the most attention was the Domestic Banks and Financial Institutions Bill, 2012, which is to replace the Banks and Financial Institutions Act. The passage of the bill was carried by the 6 senators for the ruling United Democratic Party, while all 3 Opposition People’s United Party senators, along with the representatives for the church and the private sector voted against it. The trade unions abstained. With the abstention from the unions, President Marco Pech had no need to use his casting vote. 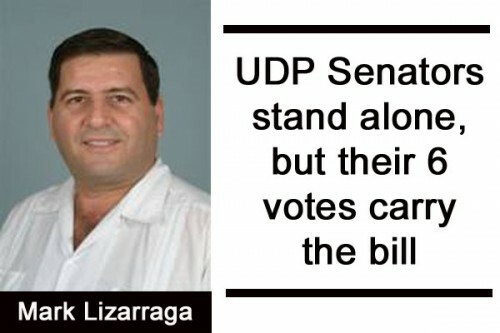 Private Sector senator Mark Lizarraga told our newspaper that the stance he took in today’s Senate meeting was based on the input from members of the Belize Chamber of Commerce and Industry and the Belize Business Bureau, which he represents in Parliament. “We just think that there needs to be some balance and that the pendulum has swung too far…” he told Amandala. He urged a serious review to make the necessary adjustments that would ensure that when enacted, the bill is in the long-term best interest of Belize. Senator Godwin Hulse, Leader of Government Business in the Senate, told us that while no amendment could today be made in the Senate, on this bill, which he said is a money bill, the Government side has taken note of those concerns conveyed by the private sector that the bill is “too draconian,” and, said Hulse, there remains the possibility of making future amendments to the law in question. He pointed out that it introduces new criminal offences and severe penalties for both new and existing offences. The private sector rep also said that the new law calls for stiff fines as well as imprisonment, on significantly harsher terms than under our current law. He also pointed to the potential impact of the bill on Belize’s economy: “Has there been any economic analysis of the impact of this Bill on the banking system and the economy as a whole?” Lizarraga questioned. He said the proposed bill is “too important not to fully consider the economic impact it will have,” and urged that the economic impact and the legal implications should be carefully reassessed in an effort to ascertain whether the bill makes economic sense. There is also the question of external influence in the formulation of the new law. Lizarraga said in the Senate that it is their understanding that the bill could be a part of the Government’s commitment to the Inter-American Development Bank (IDB), in exchange for support of the super-bond debt restructuring. When the bill was debated last Thursday in the House of Representatives, Opposition Leader Francis Fonseca had said that whereas there is need for better legislation to govern the sector, key concerns had been expressed by the banking sector, including the potential for abuse of power by the Central Bank, which ought to be considered. Citing concerns of the International Financial Services Association (formerly the Belize Offshore Practitioners Association) on the proposed legislation, Fonseca also said that the sector is concerned that the bill would operate as a substantial disincentive to the development of the financial sector of Belize. The Opposition Leader went on to say that section 73.4, which addresses financial statements, reports and accounts, requires banks to provide customer information to the Central Bank at any time upon request, and concerns were raised at the House Committee level that this may very well be found to infringe on the right to privacy set out under section 14.1 of the Belize Constitution. As things now stand, he indicated, the Central Bank can request information from banks, but it is done in the context of money laundering investigations and other cases of that nature, he indicated. Prime Minister and Minister of Finance Dean Barrow said that it was the Belize Bank that had the most difficulty with this draft bill. He went on to say that the Domestic Banks and Financial Institutions Bill, 2012, not only had the input and the guidance of the International Monetary Fund (IMF), but the actual drafting was done by a Canadian banking expert, whom he did not name. The Senate also today approved the Customs and Excise Duties Act, which is being amended “to adjust the rates of customs duties on certain items consequent upon the removal of licensing requirements and quantitative restrictions on such items…;” the International Banking (Amendment) Bill, 2012, which is intended “to clarify the provisions relating to exemption from stamp duty of documents executed by an international bank in connection with international banking business…;” and amendments to the Belize Airport Authority Act, which calls for increased penalties for violations under the act. One motion was approved; that is the motion for a loan of US$2 million from the Caribbean Development Bank for improvements in the education sector.